Barry Hastings stands on the search-and-rescue boat named in his honour. Barry Hastings is a humble man with a great sense of humour. 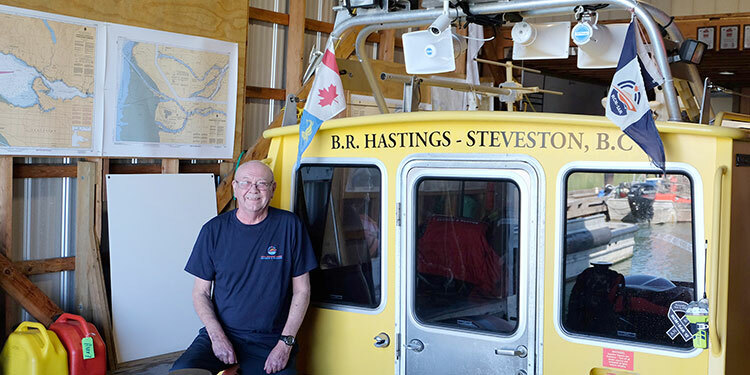 Richmond’s Royal Canadian Marine Search and Rescue, formerly known as the Coast Guard Auxiliary, recently gave the Richmond resident a 35-year award and honoured him by naming one of their rescue boats the BR Hastings. Greg Miller, currently Pacific region chair for the marine search and rescue organization, has worked with and known Hastings for 23 years. Hastings’ day job was with the professional Coast Guard, often as a radio operator. Each person’s initials were turned into a nickname. Barry Hastings says his became, “ ‘Barely Human’ because I was a practical joker. I’m still known as that,” Hastings says with a smile. After their years on the water, today both Hastings and Miller do most of their volunteering on land. “It’s a young man’s game, waking up at 2 a.m. to get up and bomb around the river and then get up and go to work,” says Miller. In addition to the numerous incidents on the water that Hasting attended both as a volunteer and as a coast guard employee, he was also the Richmond station training volunteer. Reflecting on his volunteer time, Hastings says it was a lot of fun and a lot of stress. Hastings says that at the ceremony honouring him, he only spoke very briefly.